This week we are featuring Knuffle Bunny by Mo Willems and it is BUNNY WEEK! We are so excited about bunny week that we are literally *jumping* for joy throughout this activity! 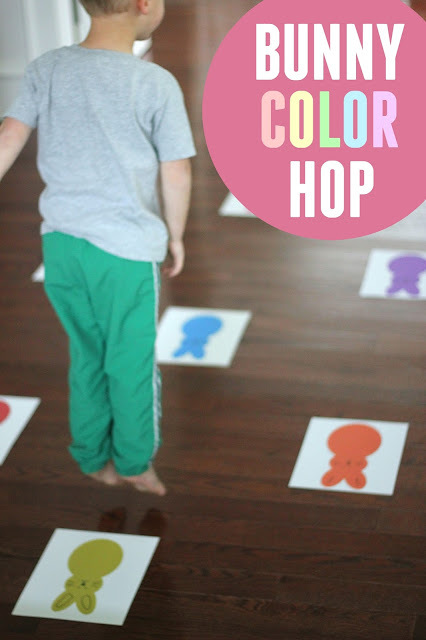 We've shared bunny patterning and other bunny crafts and this activity is a fun one to add to your repertoire! 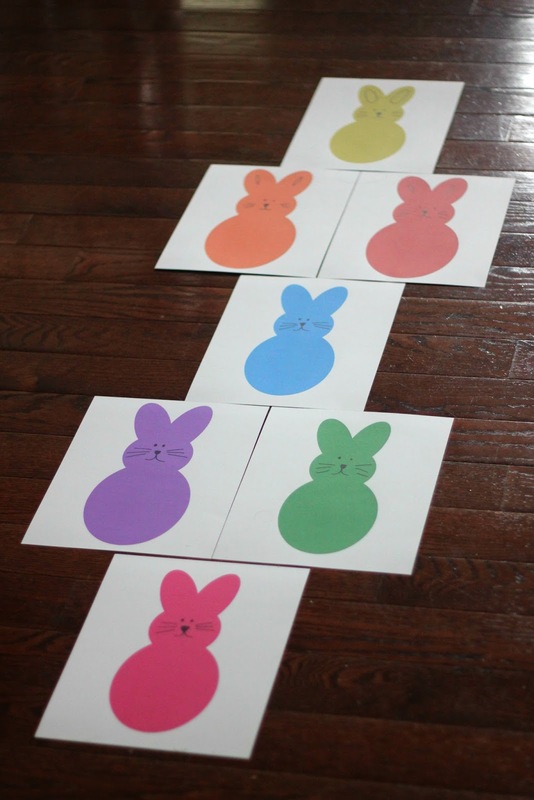 To get started you just need to print off the bunny printables and tape them to the floor! You can laminate them if you want them to last longer. I use painters tape on the floor so that it doesn't leave any residue. Make sure to tape them securely to the floor so that kids can't slip. Put the cards in any order or positions that you want! Next you are ready to start playing! For little toddlers I say a COLOR and then the kids hop to the bunny that is that color. For older toddlers/preschoolers we talk about the letter that the color starts with. I might say, "Jump to the bunny that's color starts with R." The kids will yell red and hop over to the red bunny. Sometimes I will just tell the kids to hop around wherever they want and yell the color of the bunny that they are hopping on once they reach it. Our goal is to jump as high as possible. 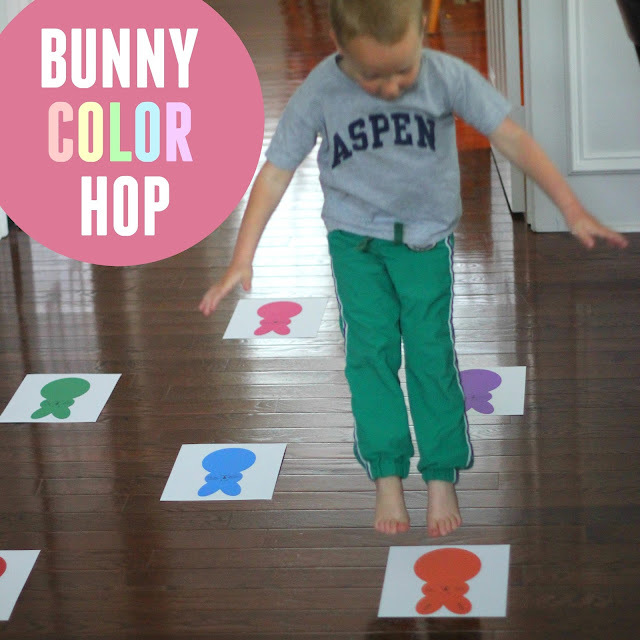 After we jumped for awhile we reorganized our cards and played BUNNY COLOR HOPSCOTCH. While we jumped we said the colors we landed on! We also took turns throwing a bean bag onto the bunny hopscotch board. Whatever bunny it landed on would have to be skipped while we hopped. We made sure to yell that color name as well! 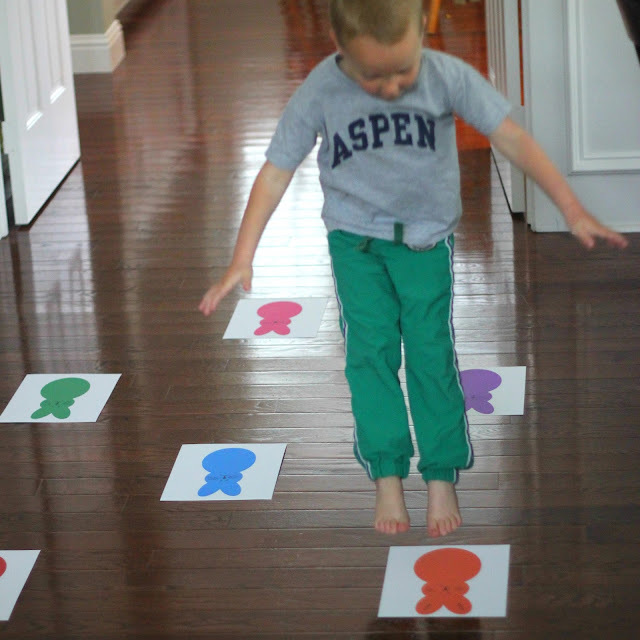 The whole goal of this activity was so have fun and work on simple color recognition. My son wanted to work on color names/spelling as well, so I added that in! 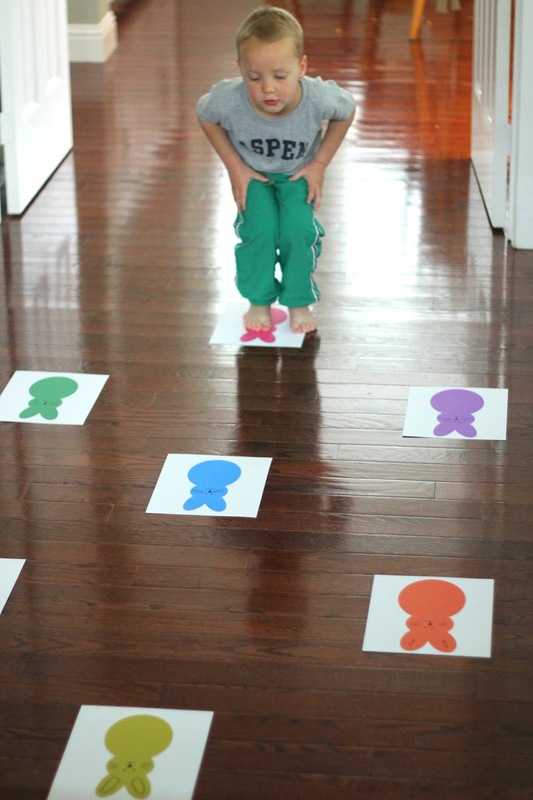 Have you ever played hopscotch with your kids before? Do you think they can hop like bunnies? Join us for BUNNY WEEK and check out all of the fun bunny themed activities shared by our Virtual Book Club for Kids co-hosts! They always come up with such fun ideas! Scroll down to see them all.